Many of the plants inhabiting northern mountains depend on the snow cover lingering until late spring or summer. 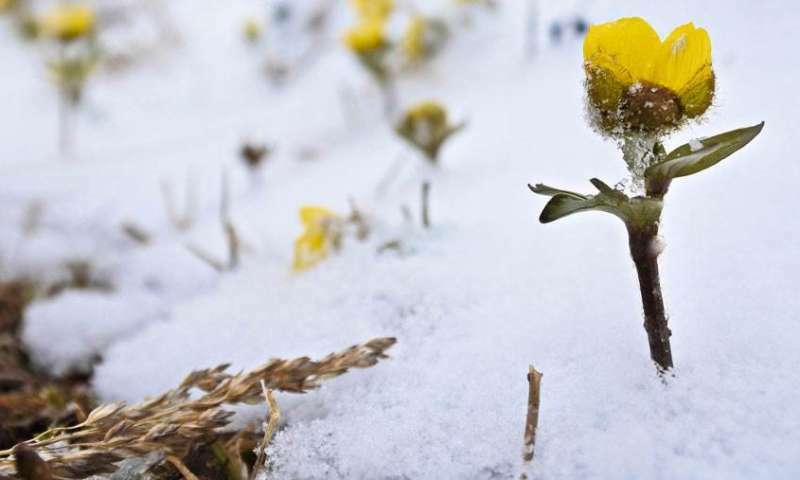 Snow provides shelter for plants from winter-time extreme events but at the same time it shortens the length of growing season, which prevents the establishment of more southern plants. This is why the reduced snow cover may be an even larger threat to the Arctic plants than rising temperatures. In a study published in the renowned scientific journal Nature Climate Change, researchers from the University of Helsinki and the Finnish Environment Institute analysed how projected changes in temperature and snow cover duration will affect the risk for extinction in northern flora. The results show that many plant species can benefit from a warmer climate, but the rapidly receding snow cover may irradicate a large part of the flora typical to northern mountains. Many of these species are already endangered, which makes their conservation an urgent challenge. "Though the significance of snow is widely recognised, winter conditions are often ignored when studying the northern and mountainous areas," says Doctoral Student Pekka Niittynen from the University of Helsinki. According to the researchers, the climate of northern areas is changing more rapidly than in the rest of the world, and these changes are especially forceful during winter. This makes the current results all the more significant. "We are worried that we don't know exactly how the snow will change as the climate warms up. We can predict temperatures fairly accurately, but it's more difficult to predict rainfall. With snow, it is even more uncertain. In parts of Siberia, for example, the amount of snow may increase due to more precipitation during winter, but the snow cover duration in the Northern countries is predicted to become much shorter," Pekka Niittynen says. "Our findings show that the future changes in northern species populations may be abrupt, giving rise to ecological surprises that are hard to predict, such as fast eradication of populations in some places and the invasion of flexible species into new places," says Senior Researcher Risto Heikkinen from the Finnish Environment Institute. "Many iconic species of the Arctic areas, such as the glacier buttercup, will decrease significantly thanks to the changing snow situation," says Miska Luoto, professor of natural geography from the University of Helsinki. "Decreasing drifts will increase the risk for extinction for plants like the snow buttercup, mountain sorrel and mossplant." The newly published research focuses on plants, moss and lichen, but the results will probably apply to many other organism populations in the Arctic. Many of the Arctic species are threatened by extinction if the species dependent on snow have no suitable areas in the vicinity where the snow cover will stay on the ground long enough in future. The means of adapting to changes in the snow coverage in Arctic areas may be few in practice. This is why the mitigation actions against climate change are vital for the preservation of northern nature.